Most valuable player at the FIBA Africa Zone Three tournament, Stanley Gumut, at the weekend led Nigeria to win the zone’s 3×3 Tour when he scored nine points and six rebounds against Cote d’Ivoire in their 17 to 13 win. A joyful Gumut described the tournament as another opportunity to develop the dunking game in Africa. Team Nigeria received $2000, as well as medals and trophies for their victory in the final game, while Cote d’Ivoire went home with $1,000 and medals, with Ghana, which defeated Togo in the 3rd place game by 18-14 earning $500 for their effort. In the U-18 category, Liberia beat Nigeria in the semifinals before edging past Cote d’Ivoire in the final, 14-12. The Nigerian boys couldn’t shake off the semi final defeat as they once again fell to Togo 8-11 in the third place playoffs. In the women category, Nigeria’s Chioma Udeaja won the tour’s most valuable player award. Her seven points helped Nigeria to victory in the final, where they beat Togo 21-9 points. Speaking at the end of the championship, reigning Nigerian Women’s League’s MVP and now FIBA Africa Zone 3 3×3 most valuable player, Chioma Udeaja, praised the idea of the 3×3 championship. “It’s really wonderful this is happening in Nigeria. It gives us an opportunity to play against international opponents and develop ourselves more as players, with more competition coming in future . Thanks to the organizers, I hope this will continue,” Udeaja said. The women champions received $1000 and a trophy, while runners up, Togo, went home with $750 and Benin Republic got $300. Nigeria’s dominance in the zone was concluded in the U-18 Girls category where they defeated Benin Republic 11-3 in the final game. 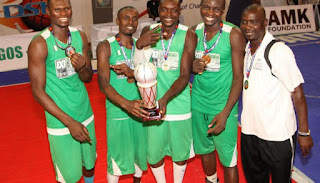 Nigeria’s Menah Daniel also took home the MVP award in the category.